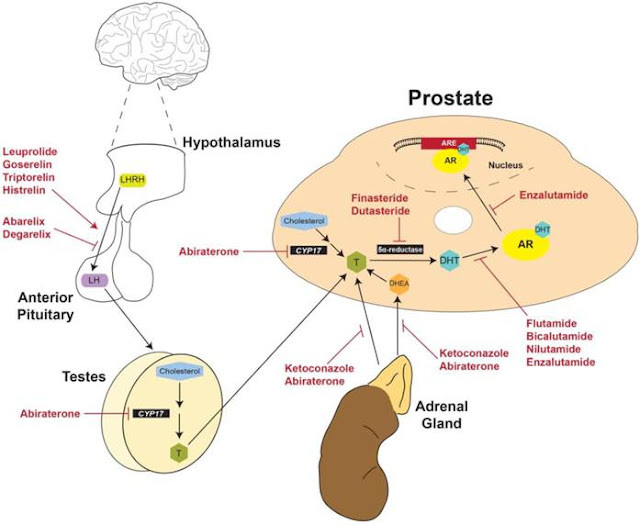 The study involved high-risk men, defined as having at least 1 of the following risk factors: T3 to T4 disease, a prostate-specific antigen (PSA) level above 20 ng/mL, or a Gleason score above 7. All of the men had node-negative disease. The 630 study participants (average age, 71 years) were randomized to either 36 or 18 months of androgen-blockade therapy, consisting of bicalutamide 50 mg (a nonsteriodal antiandrogen) for 1 month and goserelin 10.8 mg (a luteinizing hormone-releasing hormone [LHRH]) every 3 months before, during, and after pelvic and prostate radiotherapy. From October 2000 to January 2008, 310 patients were randomized to the 36-month group and 320 to the 18-month group. Most had T2 to T3 disease. At 5 years, overall survival in the 36-month and 18-month treatment groups was comparable (92.1% vs 86.8%; P = .052); the same was true at 10 years (63.6% vs 63.2%; P = .429). Similarly, at 5 years, disease-specific survival in the 36-month and 18-month treatment groups was comparable (97.6% vs 96.4%; P = .473); the same was true at 10 years (87.2% vs 87.2%; P = .838). In addition, there were no significant differences between the 2 treatment groups for a host of other measures: biochemical failure, second course of androgen blockade therapy, pelvic node metastases, bone metastases, and causes of death. At 77 months, 71 of 310 patients (22.9%) in the 36-month group and 76 of 320 (23.8%) in the 18-month group had died (P = .802). The main causes of death for all patients were a second cancer (7.3%), prostate cancer (4.9%), and cardiovascular disease (4.4%). Age was the only risk factor that was statistically significant in the study. "Older patients die more rapidly," said Dr. Nabid.